Last week was a short week for trading on the US markets with Good Friday being a day off. The jobs data that came out on friday was disappointing, so that could be a catalyst for the market this week. As the saying goes: “Weak markets will react poorly to bad news, while strong ones will just sluff it off.” This job data may be the first set of news items since the markets hit the pause button and could give us a clue as to its overall health. 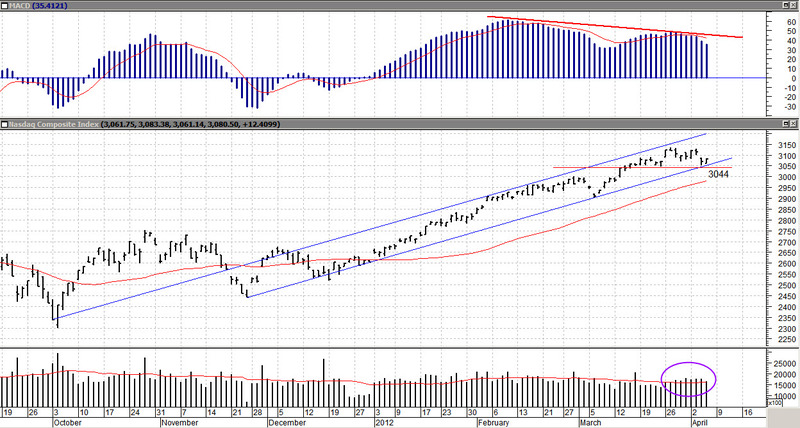 Not much to add to last weeks chart since we’re still in the upward trending channel, tho now at the lower end of it. Note the broad NASDAQ Index chart below. Price Momentum (top) is sloping down (red line) while prices are rising, and Volume (lower) is kicking up just a bit. So . . . be watchful. chart courtesy of MetaStock Equis International; used with permission. No major alarm bells going off just yet, but note the “rounding over” of this formation. If we see volume picking up on down bars (ones with lower closing prices) we’ll know that supply is coming into this market and someone is liquidating shares (distribution); if not, then just a healthy pause. table by HighGrowthStock.com; copyright 2010-12; used with permission.